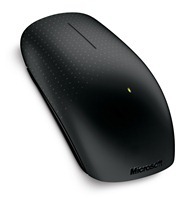 I’m sure a mouse like this would take some getting used to, but in the long run it would be a very useful mouse. I’m going to check it out when they are released. I’m sure you’ll be able to utilize different profiles (for gaming or different applications) that make the experience a lot better. For me, the most common gestures I use with the Touch Mouse are scrolling with 1 finger or minimizing or maximizing application windows with 2 fingers. But during writing this blog post, I also discovered how easy it was to use 2 fingers to slide left, then slide right on any open window to take advantage of Aero Snap. I am also enjoying moving my thumb horizontal to the left to go back in IE9 or to the right to go forward.